Pre-Emptive: Debuff protector for 98 turns and randomly blows away 1 bottom row unit. The idea behind this team is that you beat Kuma in the overworld before facing him again. Overall this team can deal enough damage to burst Kuma down in less than 3 turns. 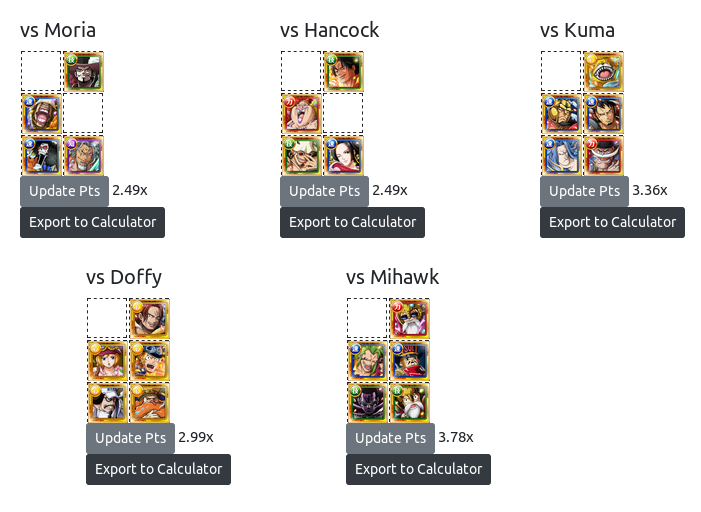 However as you increase in levels you may need to swap Zoro for another Diamante in order to make sure you beat Kuma. Pre-Emptive: Anti-Recovery for 19 turns and applies delay protector for 99 turns. HP < 20%: Binds entire crew for 20 turns. Stage 1-3: Beat normally while making sure your specials are ready for Boa stage. Stage 5: Beat the girls around Boa and then burst on Boa. Just make sure that you don’t get her below 20% or else. Another option you can do is to beat Boa in the overworld like with Kuma in order to make it easier. Interrupt: Upon defeating 1 Doffy he summons one more (occurs once). HP < 50%: Deals 50% of crew’s HP and randomly bind once unit for 3 turns. Pre-Emptive: Slot Bind/Seal entire crew for 10 turns. Interrupt: If you delay him he removes all positive buffs from your crew. Stage 1-3: Stall for specials. Take advantage of the Zombie Foxes that turn your orbs into bomb orbs in order to get Whitebeard to below 30%. Stage 4: Beat Oars normally. You can use Ace special here to make sure that you are below 30% when fighting both Oars and Moria. Stage 5: Activate all HP cutting specials first then use all other specials. 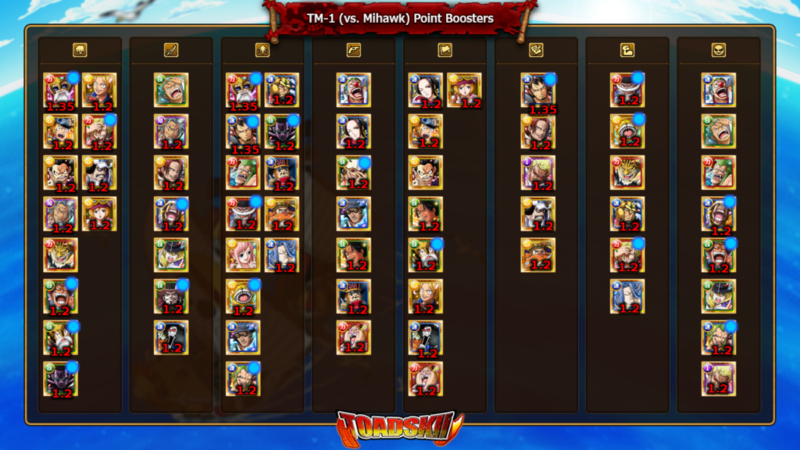 Just make sure to use Sanji before Ace if you didn’t use Ace on Stage 4. Pre-Emptive: PSY & INT units special bind for 10 turns and cut HP by 10%. After Turn 2: 10% HP cuts and normal attack. Pre-Emptive: 98 turn delay protection, DEF up (5 turns), randomly shuffles orbs (may include BLOCK), and 20% HP cut. After 1st Attack: 10% HP cut and enrage. HP < 50% (Attack): 16,500 damage. HP <50% (From a Special): Recovers to ~80% and random orb shuffle. Stage 1-3: Beat normally while stalling for specials. Stage 4: Use Lucy special, hit 4 perfects, beat Mihawk. Stage 5: You should have Lucy’s 2x ATK boost then use all other specials. Just make sure that if you use Toy Soldier to use him first and to use Colo Lucy before Colo Kyros.